“Huge bird school two miles dead ahead,” a voice boomed from the tower. “Sleeper at two o’clock from the bridge!” as the cockpit erupted with the deafening sound of ZZZZTTTT and two rods bowed toward the wake while two striped marlin greyhounded in opposite directions. Welcome to Magdalena Bay offshore on a typical day in the late fall of most years. If you were to poll seasoned captains from around the world, their consensus would be there are few spots on earth where so many billfish congregate so predictably. “Of all the places I’ve been internationally that are reputed billfish MECCAS, which include Cape Verde Islands, Azores, Panama, Costa Rica, Guatemala, Venezuela, Australia, St. Thomas, and Tahiti … NONE OF THEM compare to the sheer concentrations of marlin off Mag Bay! The fondest memory I ever shared of this aggregation was with Captain Gary Graham, and artist-brethren Guy Harvey and Kent Ullberg. We spent hours in the water with countless numbers of striped marlin over a three-day period that changed our lives forever,” William Boyce, photojournalist and TV producer recalled recently. Our first encounter of this phenomenon was in early January of 1979 when we were transiting the yacht Hardhead, a 48-foot wood-hulled Santa Barbara, from Cabo San Lucas to San Diego. The crew, consisting of my wife Yvonne, Craig Miller, Hector Sanchez, an engineer from Cabo San Lucas, and me had dropped back a few lures to break up the monotony of cruising at 7.5 knots. Just before noon as we chugged up-swell in flat, calm weather, a double strike startled all four of us out of our cruising reverie. Yvonne was the first to the rod and was soon hanging on for dear life as the fleeing striper greyhounded toward the horizon. 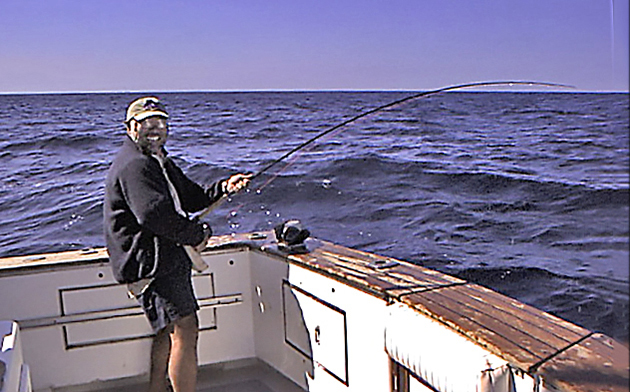 Thus began our first frantic fishing episode off Mag Bay, which continued until the sun finally crashed below the horizon. 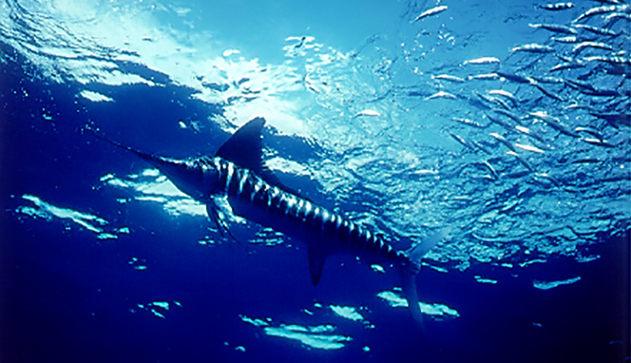 As we straight-lined toward San Diego, we hooked and spotted more striped marlin than we had ever seen in Southern California. It was the classic example of being in the right place at the right time and few people had been privileged to experience this marlin show. 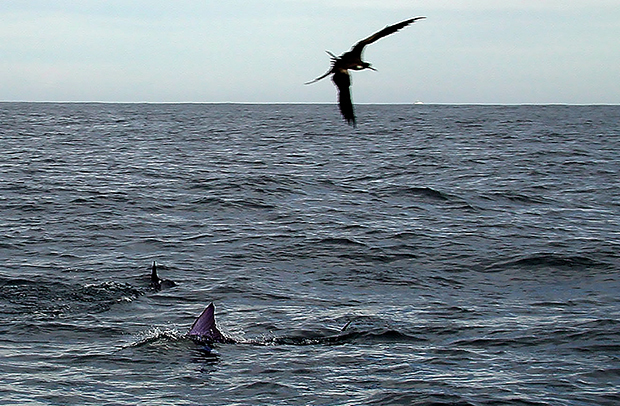 At that time, there was little knowledge about the marlin in the area surrounding Magdalena Bay. The small fleet of long range boats out of San Diego that existed then was not that interested in them, opting to chase all the other exotics found either near or on the high spots in the area. 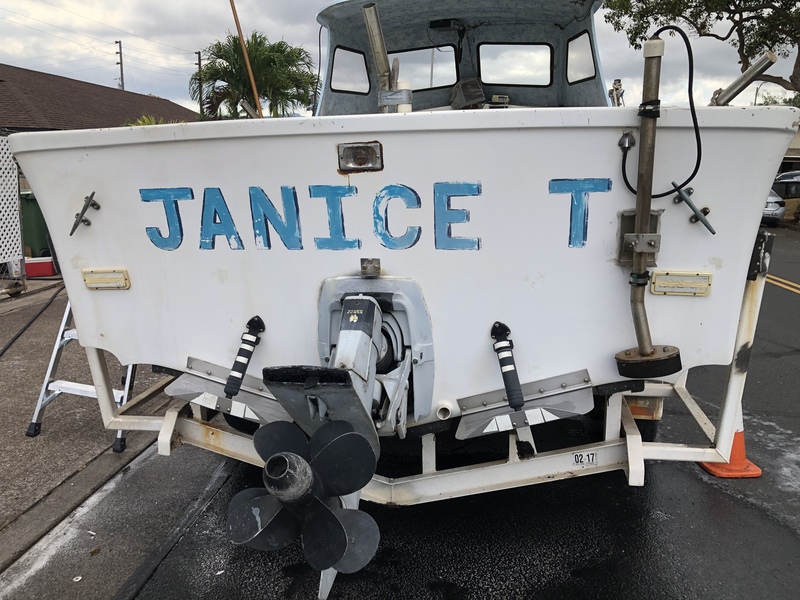 Over the years, the news spread and the number of sport fishers and yachts visiting grew rapidly, even attracting world-traveling sport fishers from the East Coast and beyond who were willing to journey thousands of miles, making their way through the Panama Canal. They return year after year, strong evidence that the stories are true; and while not a given, the event happens frequently enough to draw a small but growing fleet each year. For the uninitiated, traveling by boat (or trailering a boat down Mex 1) can be intimidating. At the risk of over-simplification, essentially, the following will help you get started. 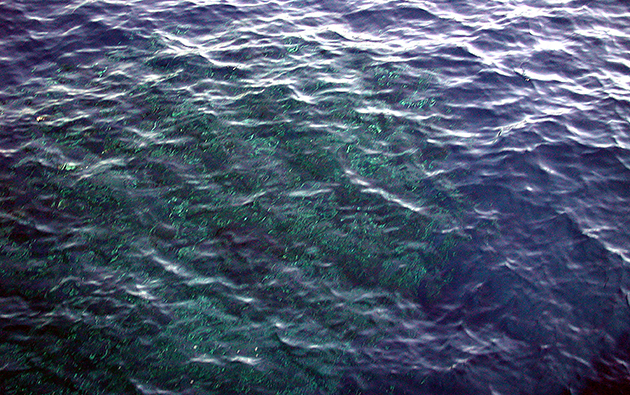 At the top end of the zone is the Uncle Sam’s Bank; traveling south from there is “the Ridge,” with various bumps and high spots that might be holding fish all the way to the Thetis Bank. 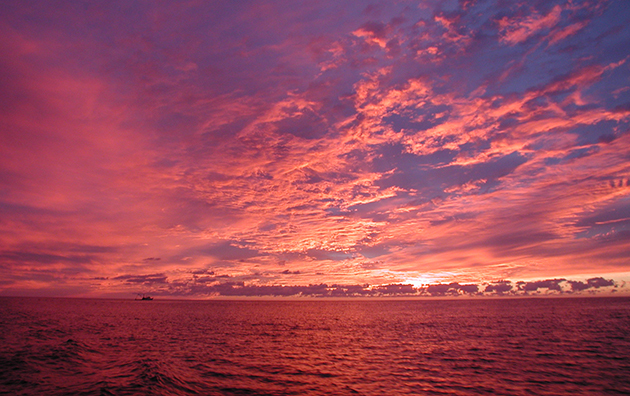 Generally, boats of all sizes fishing this zone will anchor at Santa Maria Bay – also a good place to catch mackerel. 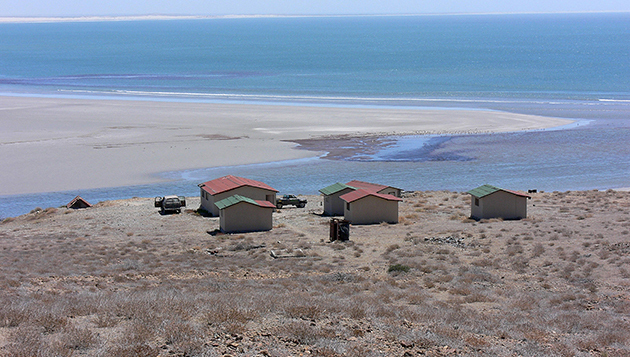 If the fish are farther down and out in front of the entrada, the best anchorage is at Belchers, a fish camp a few miles inside the bay. This is another decent spot to load up the tanks with mackerel. Another anchorage is in front of Magdalena City, although the bait fishing is not normally as good there. If the main body of fish is in the lower zone outside of Punta Tasco at the south end of Isla Santa Margarita, your anchoring options are either Punta Tasco or along the lee of the island, if you are adventurous and willing to run the narrow channel into the bay. But before we talk about the fishing, it’s important to understand that fishing Magdalena Bay offshore is to fishing what White Sands Missile Range is to missile testing or Bonneville Salt Flats is to car racing. 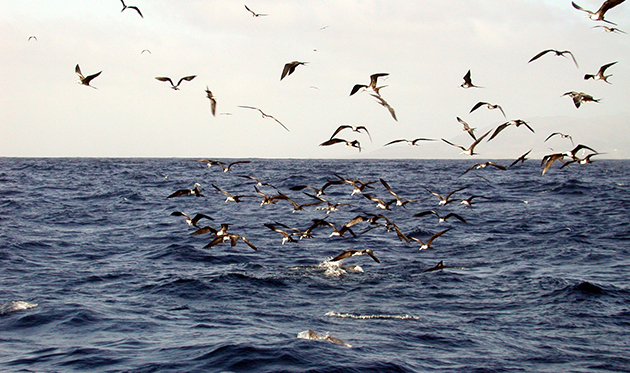 The volume of billfish and other species found here requires rethinking your approach. 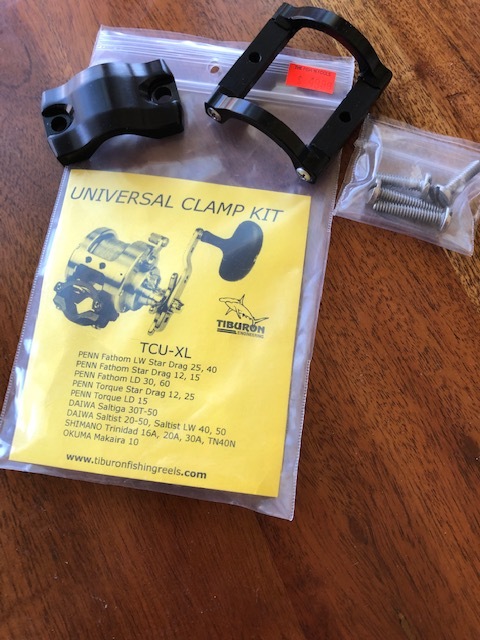 This is literally “fishing proving grounds,” where, in all likelihood, your crew will hook more fish in a week or two than they will see in Southern California over 10 seasons. Boats and crews dazzled by the sheer volume often think that triple-digit totals are what it’s all about. 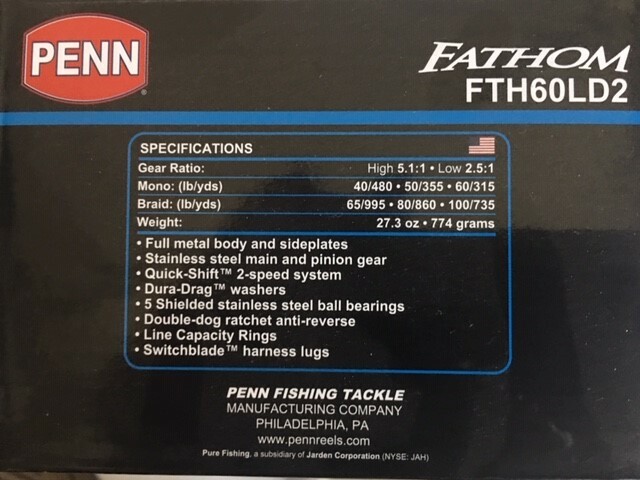 Over the years, I’ve known many captains who wisely focused on taking advantage of the volume to fine-tune their fishing techniques on a variety of tackle – light, heavy, spinning and fly – or who wanted to improve their boat handling, cockpit management and fish finding capabilities, and who ultimately returned home much more skilled than when they arrived. 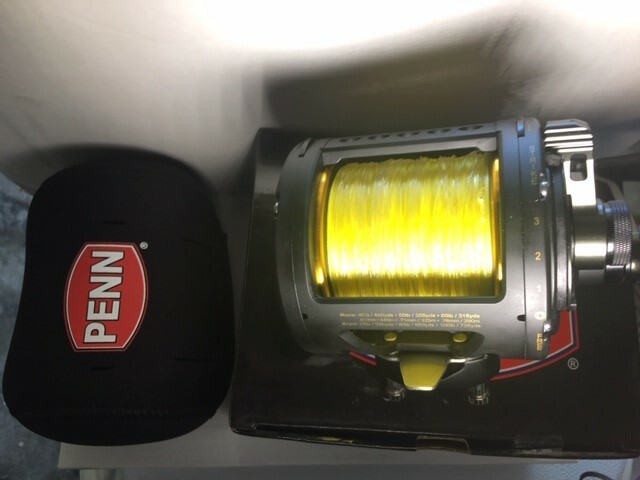 One of the mistakes often made by visiting sport fishers is heading straight for the high spots and not paying attention along the way. 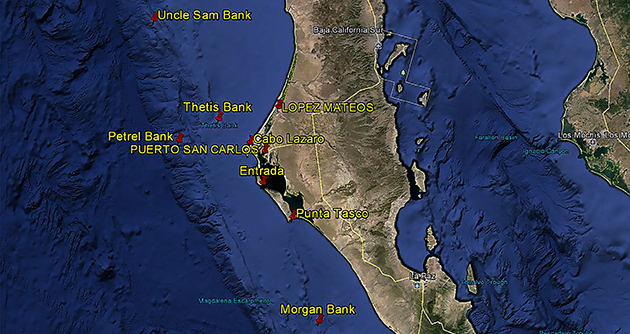 Leaving from Santa Maria, always check the 100-fathom drop-off northwest of Cabo San Lazaro for bird schools. In addition to terns, this is frigate country and they are easy to spot from long distances away, either high flying or in bunches down closer to the surface of the water – a sure sign that there is bait being pushed to the surface. Often, we find fish inside a straight line drawn from Cabo Lazaro to Thetis Bank back toward Lopez Mateos, where few boats venture. 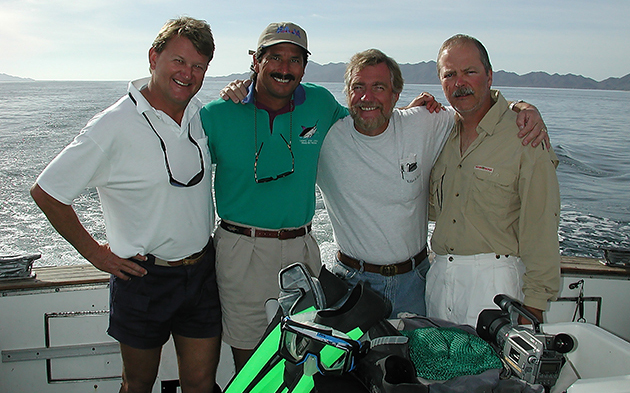 Years ago, when I was on a six-week back-to-back trip with clients of our company, Baja on the Fly. 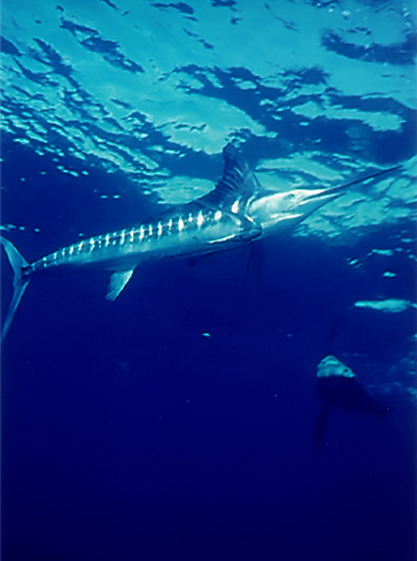 Joining me on one of the trips was Guy Harvey, William Boyce, Kent Ullberg and Charlie Foreman to film “Underwater Realm, Magical Encounters: Striped Marlin. The globe-trolling 115-foot God’s Will, and a 48-foot Sport Fisher, God’s Favor mother ship operation, originally built by Jerry Dunaway and subsequently sold to Craig Morgan from West Virginia, arrived after traveling all the way from Miami. Captain Bubba Carter was running the day boat God’s Favor. That year there were few boats fishing the Magdalena Bay area and Bubba and I became friends; we shared fish dope every day. The boat I was using that year was slow, so we habitually left the anchorage at gray light. “Bubba,” with the luxury of a much faster ride, left after a leisurely breakfast. 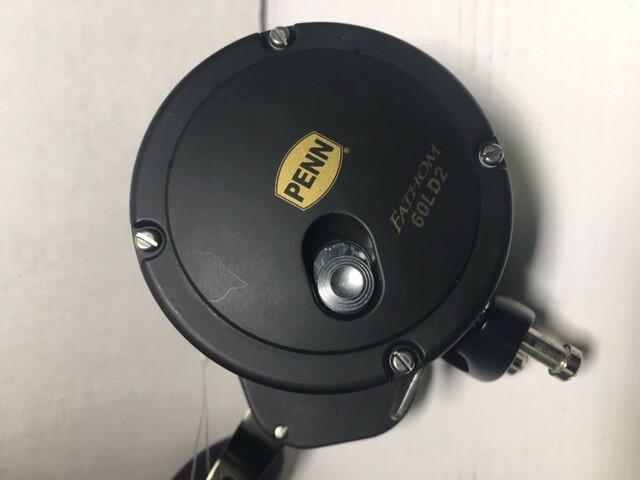 Often, the God’s Favor could be seen speeding north for Thetis Bank, while we would be in solid fish either east or west of his course line keying the microphone, “You might want to slow down,” was all it took and God’s Favor would cut the run short. Just because a fleet is gathered on a high spot doesn’t necessarily mean that it’s productive. This zone covers a lot of water worth checking out. However, even when the billfish are missing there are usually wahoo, dorado and tuna on the high spots offering some spectacular action. 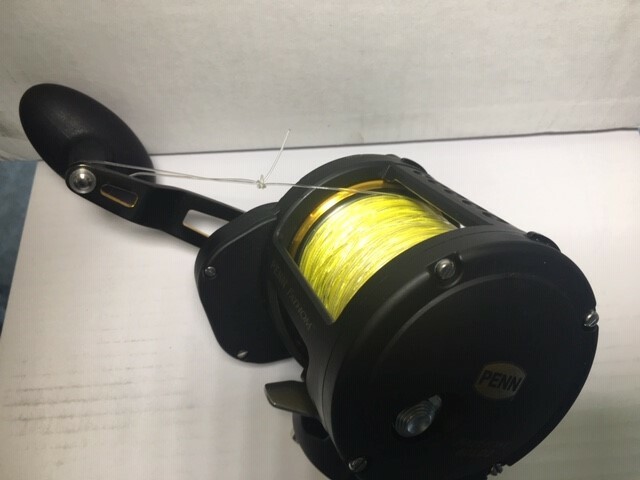 Although local knowledge is always essential when fishing, equally important is staying in communication with other visiting anglers who happen to be fishing offshore. Both Bubba and I had a successful season that year. My fly and film groups went home bragging about their trip of a lifetime. 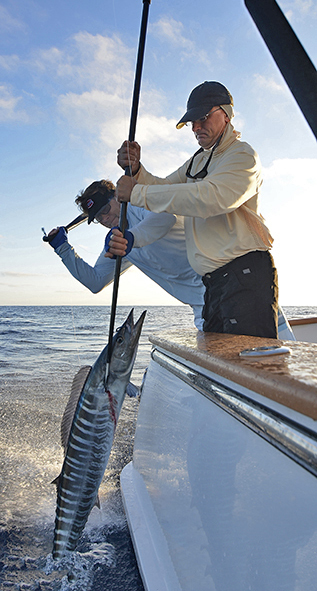 Same story for Bubba and his groups; Charlie Tombras, of Knoxville, Tenn., captured a 94-pound striped marlin on 6-pound tippet setting a new IGFA World Record at the time. 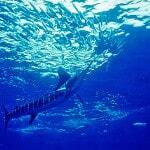 “The striped marlin fishery at Mag Bay is the best there is! 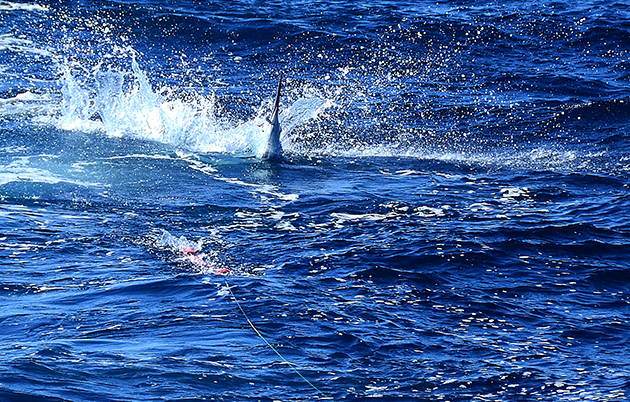 When you see the bait show with striped marlin, sea lions, dorado, tuna and whales, it’s like a National Geographic movie … a fantastic fishery,” Carter marveled recently. The outstanding offshore fishing in front of Magdalena Bay enjoys an almost mythical appeal and the Esteros offer a quiet solitude. However, there are trophy fish cloaked in daunting challenges in this unusual fishery. 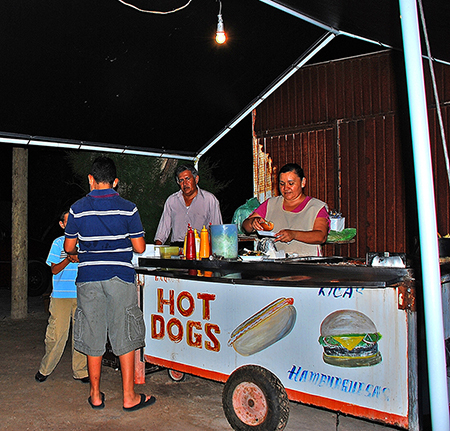 At the same time, the area with its old Mexican charm remains unblemished by real inroads of tourism. 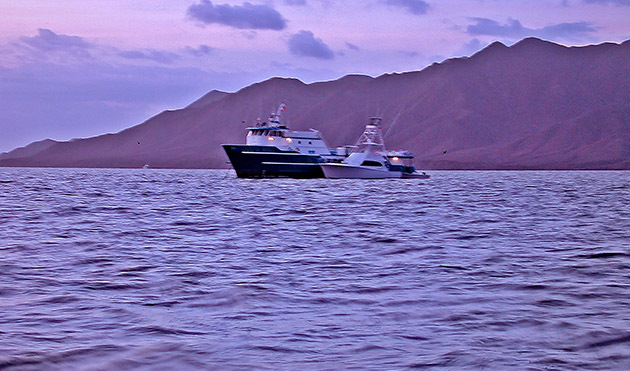 Its popularity is growing; each year the number of local boats large enough to access the offshore action comfortably has grown and many yachts traveling to and from Cabo plan their trips to take advantage of the outstanding fall fishery off Magdalena Bay. 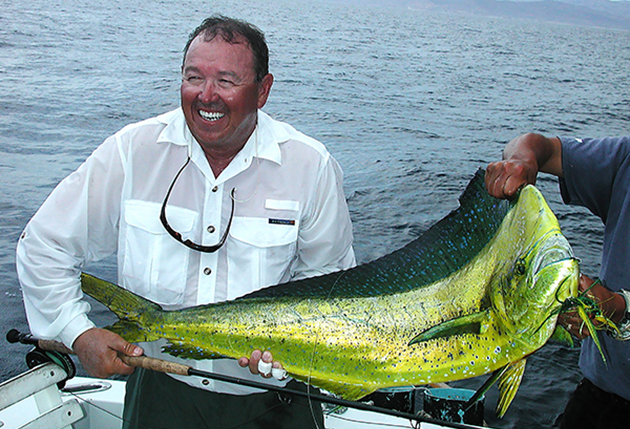 The schools of marlin, wahoo, tuna and dorado are consistently the largest found anywhere in Baja. 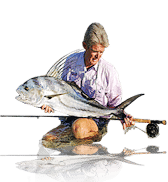 Conversely, the number of boats fishing there is still minimal compared to any other Baja destination, and seldom is the visiting recreational fleet large enough, nor is the area fished tight enough, to cause any issues. Many visitors have voiced concerns that more recreational activity will ruin the destination, when in reality, the increased traffic may be the best thing that could happen — pressuring local commercial interests to realize the significance of the visiting anglers’ dollars. Hopefully the local residents and businesses will recognize their value. 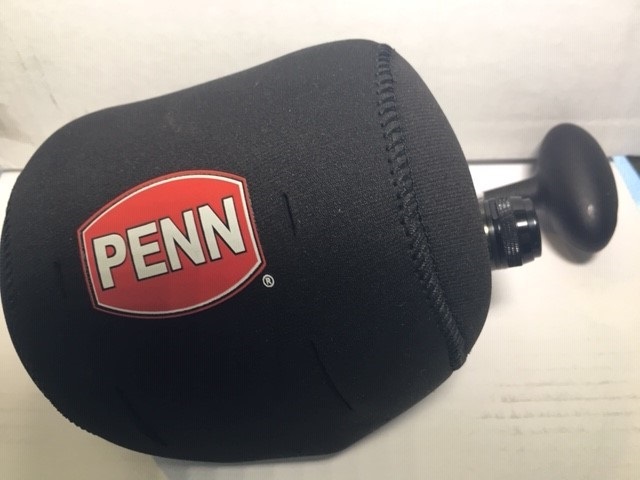 Fuel may be purchased at the Pier through API. 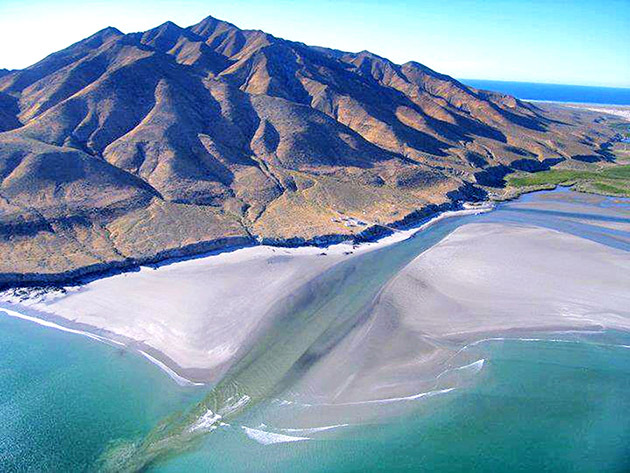 Puerto Adolfo Lopez Mateos, Baja California Sur, Mexico. 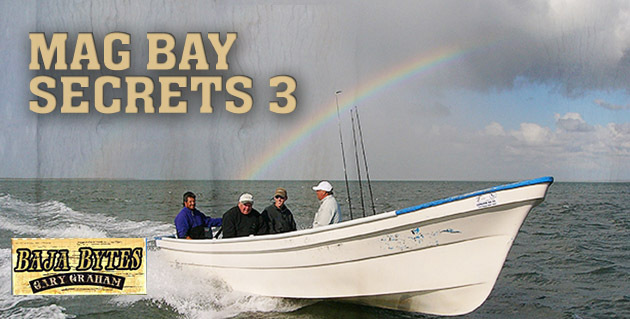 Mag Bay Outfitters, Rentals, Whales Tale Inn, on Magdalena Island, RV park, Boat storage, Surfing, Whale Watching, Sportfishing, Esteros and offshore.